In a mature industry like ours, most firms will reference themselves as ‘client-centric’ on some medium or other – and so it should be natural for clients seeking wealth related guidance to turn to their advisors for support. 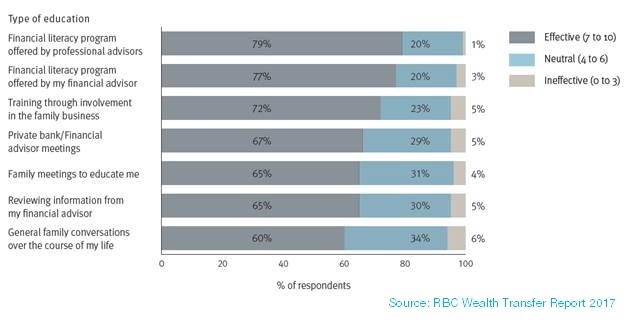 But recent research by RBC Wealth Management and Scorpio Partnership proves a reality check for advisors. High-net worth individuals feel more comfortable turning to their relatives for education on money matters than their wealth manager, or any other professional source for that matter. For advisors gearing up to attract the clients of tomorrow, this finding presents a stark challenge. According to the 2017 Wealth Transfer Report, which covers the UK, US and Canada – an estimated US$4 trillion of HNW assets will pass from one generation to the next in the coming years. The opportunity to support next-gen clients is therefore obvious. And yet, as they approach some of the most important financial junctures in their life, today’s clients find themselves looking overwhelmingly homewards. Q: Have you ever received any formal education / guidance to improve your understanding of wealth and money? When it comes to learning about wealth, HNWs are keeping it in the family [Figure 1]. General conversations with relatives, backed up by reading around the subject, are more popular routes to learning about wealth than more formalised initiatives, such as financial literacy programmes. The gravitational pull of family guidance becomes even stronger at emotionally charged times. For example, at the point of inheritance, only 15% of individuals rely on support from a professional. 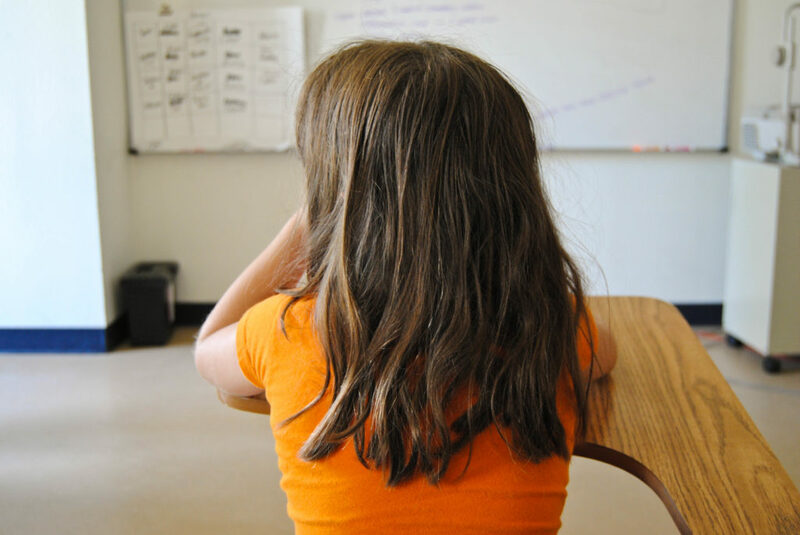 And the apple doesn’t fall far from the tree as parents later replicate their personal experiences when making education choices for their children. For example, parents can over-emphasise subjects that they prioritised in their own financial learning, such as budgeting and investing, rather than broadening the thematic content to areas which may also be more beneficial, like family governance or portfolio management. Interestingly, the research also highlighted that the informal tactics deployed in financial learning don’t necessarily lead to higher confidence later in life. 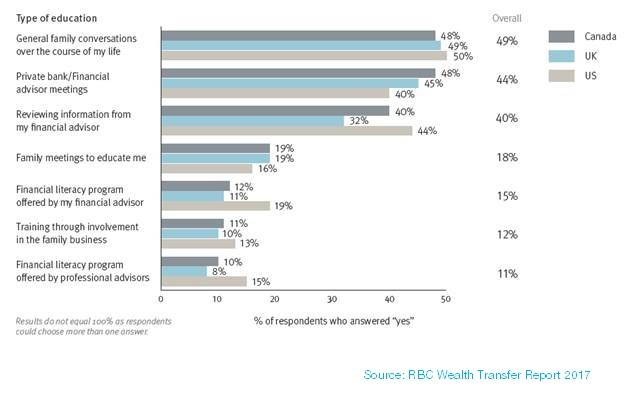 Despite low take up, clients feel that formal initiatives are more effective at improving their financial knowledge than family conversations; the most confident clients are those who’ve had a ‘blended’ education of formal and self-directed learning from a young age. Q: On a scale of 0-10, how effective was the education you received in enhancing your knowledge of wealth? Empirically, we also know that wealthy individuals who started their education before the age of 18 are now, on average, more confident in their financial understanding. Yet most are typically aged 27 before they start to learn about money matters, suggesting families are leaving it too late. And while all will acknowledge that it is natural to seek familial support in difficult or emotional times, many will also agree that ad hoc financial home-schooling is not a suitable strategy for long-term wealth preservation. Clients will need to broaden their horizons when it comes to their financial learning but wealth managers will need to expand their educational appeal to highlight how and why clients should come to them to enhance their expertise. To read the full report Wealth Transfer Report 2017, please visit this link. Expertise: Tasha co-leads our thought leadership initiative at Scorpio Partnership and also supports on market insight and strategy projects. Prior to joining the team last year, Tasha worked at an insight and innovation consultancy, where she supported a range of clients to develop growth strategies. 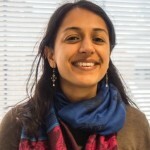 Background: Tasha holds a Master’s degree in EU governance from the LSE and a Bachelor’s in Philosophy, Politics and Economics (PPE) from Keble College, Oxford. She enjoys brunching, watching Frasier re-runs and learning Spanish, but finds the idioms are often her downfall.